Moscow’s role in crafting symmetry in New Delhi-Beijing ties will be crucial. While working in tandem the three countries can not only effectively address mutual differences but also help address international issues. Indian Prime Minister, Narendra Modi’s meeting with Chinese President Xi Jinping at the sidelines of the BRICS summit in Brazil last week has drawn considerable attention, certainly for good. The meeting provides clues about the direction of the relations between the two neighbours, relations between which belie a steady pattern. Russia has long eyed warming of ties between the two Asian giants. Xi’s invitation to Modi to participate in APEC, a premier economic body in Asia-Pacific, has led to considerable speculation about China’s real motives. Xi also invited India to be a founding member of Asian Infrastructure Investment Bank. How far are these invitations backed by genuine political power of China? Is the Chinese invitation a shrewd move to moderate some of India’s positions? Is it a move for a trade-off? There is speculation that China might have offered some concessions to India to bag the key deal – establishing the bank in Shanghai. But a China-India trade-off is not that easy as it is constrained by procedural as well as political hurdles. All APEC members have to approve a new member to the group. The political hurdles may be more difficult to surmount. The US, which has recently increasingly asserted in the Asia-Pacific may view the Chinese offer to India as a pawn in the strategic chess board antithetical to its interests. The US-China rivalry, rather than the differences between the US and India, or between India and China, may impact the move. Even the Chinese intentions, and policy manoeuvres in this context, are yet to be weighed upon in-depth by the Indian policymakers. Perhaps Russia is best suited to play a balancer in this case. Close to India and China, and a key player in APEC and BRICS and regional organizations such as SCO, Russia will be positioned not only to forward the interests of India but also help broker a deal between India and China. Russia has supported India’s bid for candidature for many international and regional organizations including United Nations Security Council and Shanghai Cooperation Organization, even to the dislike of China. Particularly in case of SCO, it is believed that India’s membership is withheld due to Chinese prevarication. Xi during his meeting with Modi called for India’s active role in the regional organization. But, it is yet unclear, whether Xi would support India’s membership of SCO. Russia’s role in crafting symmetry in India-China relations will be crucial. While working in tandem the three countries can not only effectively address mutual differences but also help address international issues. While Russia can persuade China to adopt a softer approach towards India’s integration with SCO and APEC, India and China can support Russia in the crises in Ukraine or to help mete out the effects of the sanctions. It is no surprise that the BRICS in its Brazil meeting expressed deep concern over crisis in Ukraine and called for “comprehensive dialogue, the de-escalation of the conflict and restraint from all the actors involved, with a view to finding a peaceful political solution.” Putin expressed satisfaction at the developments in the summit and argued that the joint efforts will help prevent economic difficulties. Any trade-off between India and China will not be that easy. Mutual distrust creeps deep in bilateral relations. As guardians of national interests, Xi and Modi may find it difficult to rise above the distrust-guided national interests. But, it is not impossible. As hard-headed pragmatists they may find ways to address the differences. Modi called for, and Xi agreed, for a peaceful and tranquil border. Modi invited China to invest in infrastructure projects in India. Xi may appear less inscrutable than his predecessor, Hu Jintao, whose stoic appearance befuddled many international leaders and observers. Xi appears more forward looking, and his pleasant mien, may be an advantage for China. But, in international diplomacy, it is difficult to go by appearance. To decipher things, one has to go deep and study between lines. 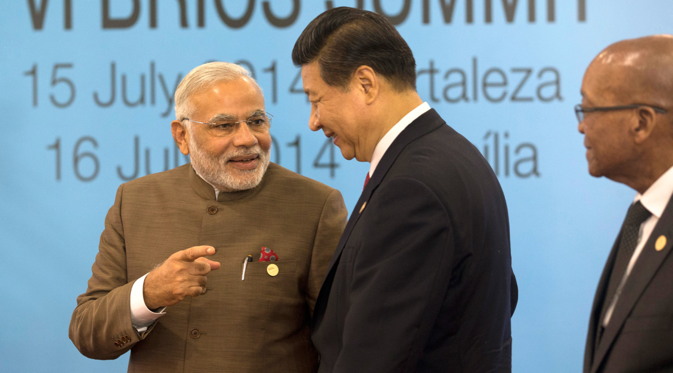 The advantage for Modi and Xi is that they are in the real command in their countries. They are pro-business, young, and dynamic. Each is aware of their core national interests and constraints behind realizing them. A win-win trade-off between India and China will not dawn a new entente a bilateral relations, but will also herald a new phase in international relations. A strengthened India-China relationship will further strengthen Russia-India-China (RIC) relations, as well as BRICS, SCO and other important organizations such as G-20. By the time Xi visits to India in September, one hopes some of the differences will be resolved. What role can Russia play in this new environment? Besides meeting Xi, Modi also met Russian President Vladimir Putin. Russia is a known strategic partner of India and China, and has been consistent in supporting India’s political ambitions. Add to this China’s willingness to support India in its bid for membership for APEC and SCO, the international politics will come to a full circle with possible rising of a new order. One of real dampeners behind weakness of BRICS is India-China differences, and once this is addressed with trade-offs between India and China, the group will emerge a new centre of attraction in the post-Cold War world with implications for bilateral and international peace and security.